This design has a regular beta biothane Halter with buckles on both sides & a brass button stud in the center of the poll piece, that keeps the removable brow band and the add on headstall portion of the bridle secured together. Simply pop off the add on headstall portion which holds your bit and the brow band, leaving you with just your halter for tying or vet check comfort for your horse. Very nice for those that want only the halter in the vet check area, and prefer our add on headstall to the bit attachments on the cheeks. 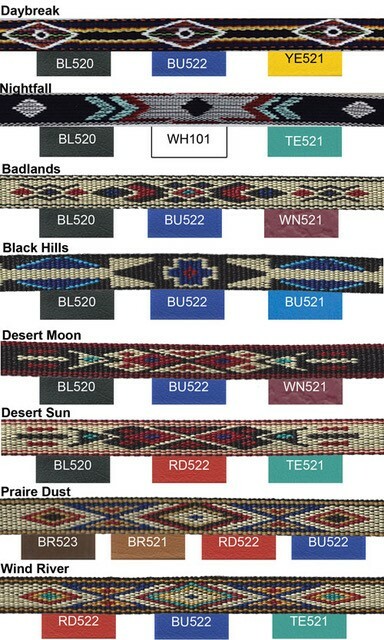 Your choice of Navajo nylon webbing design on the brow band, nose band & cheeks of this halter bridle combination.